June 16, 1939, was a hot day with temperatures reaching into the lower 90s at the University of Virginia. Graduation had been held four days earlier so the number of students on grounds had greatly diminished. With no English classes to teach, Professor Atcheson L. Hench had some time to devote to one of his many interests – photography. He enjoyed focusing his camera on construction projects at the University as well as old homes, some that were later remodeled or razed. On this blistering summer day the 49-year-old Hench walked the University grounds and captured images of a building that was being demolished. Not just any building, but one that was designed by the founder of the University of Virginia, Thomas Jefferson. What structure was this, why was it erected, and how did it meet its end? 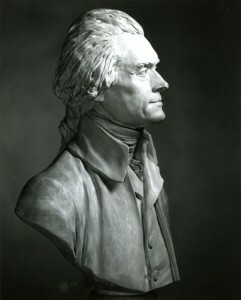 Thomas Jefferson Bust by Jean-Antoine Houdon, replica of the original done in 1789. Prints16054, Special Collections, University of Virginia Library, Charlottesville, Va. Professor Dunglison and his new wife landed in Norfolk, Virginia, on February 10, 1825. After a stop in Richmond, they proceeded by stagecoach toward the University until an accident forced them to walk the last two miles into Charlottesville. The couple first stayed in one of the University hotels and then slept on the floor of their pavilion until their goods arrived. Twenty-five years later, Dunglison wrote of not being dispirited by his harsh introduction to the new world, but of eagerness “to be transferred to a sphere in which I could be useful.”  His acceptance of these early aggravations indicates he was good-natured, but he was probably dismayed at the lack of a building specifically devoted to the teaching of medicine and anatomy. It was anticipated that professors would teach in the pavilions where they lived, but he could hardly be expected to conduct dissections under a family bedroom. 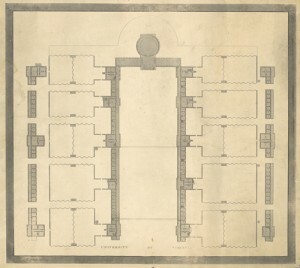 Plan of the University by Peter Maverick, 1825, based on John Neilson’s drawing, 1822. Robley Dunglison would live in the pavilion to the lower right. Accession #6552 and 6552-a, Special Collections, University of Virginia Library, Charlottesville, Va. Early plans of the University did not include an anatomical theatre for the school of Anatomy and Medicine. Jefferson designed the University to have a Rotunda, two rows of buildings flanking the Rotunda with five pavilions each for professors to live and teach in, student rooms between the pavilions, gardens behind the pavilions, and another row of buildings behind the gardens containing additional student rooms and hotels, which included service buildings and dining areas. John Neilson made several drawings of the Lawn in the early 1820s based on Jefferson’s plans. Peter Maverick used those drawings for this 1825 engraving of the Lawn. Neither Neilson nor Maverick included an anatomical theatre. University of Virginia, Board of Visitors. Minutes, April 29, 1938, 293. Retrieved from http://guides.lib.virginia.edu/bovminutes. Cabell, Nathaniel Francis. Early History of the University of Virginia, as Contained in the Letters of Thomas Jefferson and Joseph C. Cabell. Richmond, Va.: J.W. Randolph, 1856, 430. Retrieved from HathiTrust Digital Library. It was resolved to change the name at a Board of Visitors meeting held on July 19, 1827, from the school of Anatomy and Medicine to The School of Medicine. University of Virginia, Board of Visitors. Minutes, July 10, 1827, 180. Virginia. Proceedings and Report of the Commissioners for the University of Virginia, presented December 8, 1818. Richmond: Printed by Thomas Ritchie, 1818, 19. Retrieved from Readex. University of Virginia, Board of Visitors. Minutes, April 5, 1824, 62. Radbill, Samuel X. (Ed.). The Autobiographical Ana of Robley Dunglison, M.D. Philadelphia: American Philosophical Society, 1963, 9. Dorsey, John M. (Ed.). The Jefferson-Dunglison Letters. Charlottesville: University Press of Virginia, 1960, 11. Office of the Architect, University of Virginia. The Rotunda, Historic Images, 231-233. Retrieved from http://www.officearchitect.virg inia.edu/pdfs/historicimages1.pdf.